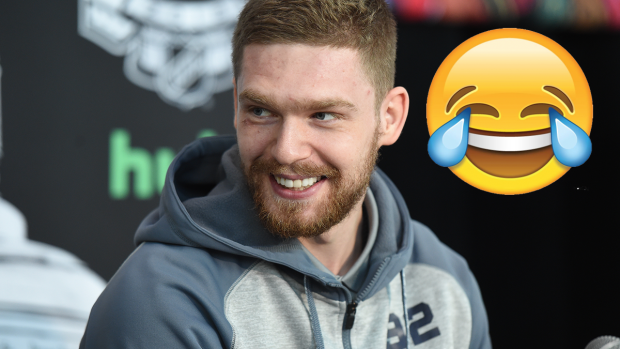 Evgeny Kuznetsov is one of the fun-loving personalities that have made the Washington Capitals such an easy to like team over the past couple of seasons, but they’re facing off against what could be the most likable team of all time. The Vegas Golden Knights are a Cinderella team that rallied a city after their season started with tragedy. Their players refer to themselves as the “Golden Misfits” because they are a collective that was thought to be expendable by their former teams. They have rallied against all odds and after making people look foolish for a full season, people really seem to be buying in. After all that, they’re also led by a guy who never stops smiling between the pipes. Marc-Andre Fleury’s smile can be spotted in any game and that’s why Kuznetsov is so excited to play him – he likes to smile too. “I love to smile during the games sometimes too, and it’s nice when you made a great play or the goalie stops the puck and you smile at him and see he’s smiling back. He shows the support and respect”. Kuznetsov is totally right. Those cheeky moments of competitiveness make sports more fun for everyone involved. The athletes ramp things up a bit and the fans can appreciate the mental battles that the teams will go through every game. The Capitals love to have fun.